I love a good mafia drama. There is just something so thrilling and cool about seeing the seedy underbelly of a city and the back door games and scams that the mob plays out. From ‘Goodfellas‘ to ‘The Departed‘, the characters are so well though out and detailed that you can spend over three hours with them and feel like only five minutes have gone by. You could say that a lot of these iconic characters are larger than life itself, which is true, given their past historical accounts of what they did to earn money and gain power. But that is where Michael R. Roskam’s adaptation of Dennis Lehane’s short story, formally called ‘Animal Rescue‘, but now called ‘The Drop‘ differs. This movie is not in the possession of Roskam’s camera or Lehane excellent screenplay here. Nor is it in the late legendary hands of James Gandolfini. No, this movie is Tom Hardy’s film one-hundred percent, and he owns every second of this film with his powerful yet very vulnerable performance. Hardy has taken this mafia story down a different path than usual, despite you seeing the same plot many times before. But somehow here, it feels very fresh and different. I have no doubt Roskam has a bright future ahead of himself. Hardy plays Bob the bartender who tends bar for his cousin Marv (Gandolfini). Marv’s sports bar was taken over by some Chechen mobsters several years ago, and now Marv is forced to just run the day-to-day operations rather than own the joint. The Chechen mafia use this bar as well as several others in the area as their personal banks, where large scores of illegal money are passed through the bar for these mobsters to collect every night. When Marv’s bar is chosen as the bank drop for the evening, many people come through slipping under the table large sums of money that goes into a time release safe. In the morning, after the drunks from the night before pick themselves up off the ground, the mob bosses come to collect everything, and you’d better hope all the money is all there. Marv, who is still sore about his bar being taken over by the mob, engineers a hold up of his own bar to score some cash. But this is a mere test for a possible even bigger score later on down the road. Marv doesn’t involve Bob in this scheme, because Bob is too smart to do anything too stupid like this. And he is pre-occupied with taking care of a puppy pit-bull he found abused in a trashcan and the pretty woman who helps him take care of it named Nadia (Noomi Rapace). 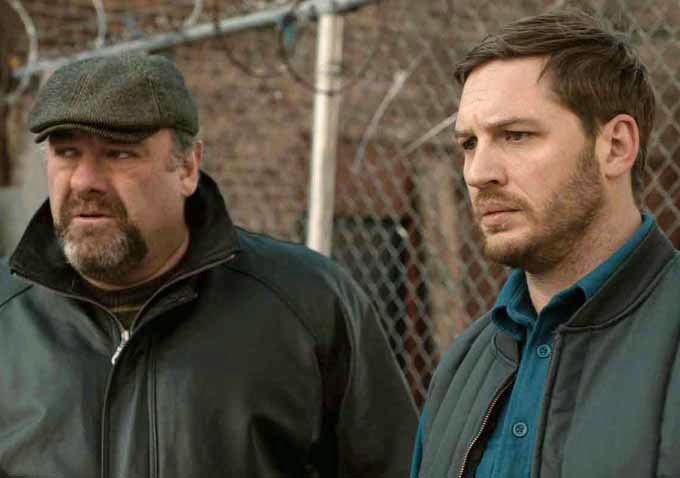 But since the robbery and finding the pit-bull, more trouble seems to find Bob by the way of police detective Torres (John Ortiz), who recognizes Bob from Sunday mass and the neighborhood loser Eric Deeds (Matthias Schoenaerts), who starts stalking Bob and asserting that Bob pay him money for the dog and his new female friend. This is not a movie about the powerful mob guys who kill and steal every chance they get. This about the guys who are not in power, who are trying to lead decent lives who might have have wanted more in life, but were too lazy or to stupid to cash in on it, and they are making one last desperate attempt to have a life they wanted. It’s quite brilliant in fact. Lehane’s script is spot on, as he gives us small details of each character’s backstory without giving too much away, so that we may think for ourselves on what their lives were like and how they ended up this way. His work on HBO’s ‘The Wire‘ is evident here too. I think the film could have been just as good without Nadia’s character, as she doesn’t provide anything to the story other than something Bob could look forward to someday. But again, the character is still good and never brings the movie down. This is Gandolfini’s final film role, and while he plays something similar to Tony Soprano, you can see his hurt and pain over the years as he has tried to make his family happy. He truly is one of the greatest actors to every grace the screen. And Hardy just gives Bob so many dimensions, and just like in the movie, “You will never see him coming.” There is so much mystery around Bob, but you like him because he is shy, awkward, and endearing, but he does have a very dark side and you’ll want to see how he handles this situation that Lehane and Roskum have conjured up for us in ‘The Drop‘. Film Review: ‘Live By Night’! This entry was posted on Friday, September 12th, 2014 at 10:53 am	and is filed under Film, News. You can follow any responses to this entry through the RSS 2.0 feed. You can skip to the end and leave a response. Pinging is currently not allowed. « Film Review: ‘Dolphin Tale 2’! !